This recipe is based on a traditional favourite sold in most New Zealand bakeries. It was pretty easy to make and I'm sure I'll be making it more often. Mix in the vanilla essence and egg. Add sifted dry ingredients. Mix until it forms a stiff dough. Divide in half. Roll out both halves to the size of slice tin to about ½cm thick. Place bottom half in the tin. It's fragile but you can just blend it together. Spread raspberry jam generously over the bottom layer. Bake for 25-30 minutes in a pre-heated moderate oven (180°C). Ice (frost) with raspberry icing (frosting) when cold. Tip: Strain the raspberry jab to remove the seeds, or use some other flavoured jam. The icing is a hard icing, quite different from a butter icing. Sift icing sugar into bowl. Add butter, and enough water to melt butter and mix to a smooth consistency. Spread over the cold base. Make wavy lines with a fork when the icing is nearly set. What's your favourite memory about raspberry slice? Let me know what you think when you try this recipe. This entry was posted by shadowfoot and is filed under Baking, Sweet things. I have tried this recipe twice but it has turned out far too sweet - I prefer the tartness that only real rasbery jam can deliver. On my next attempt I may use Rasberry Jam to give it some bite. 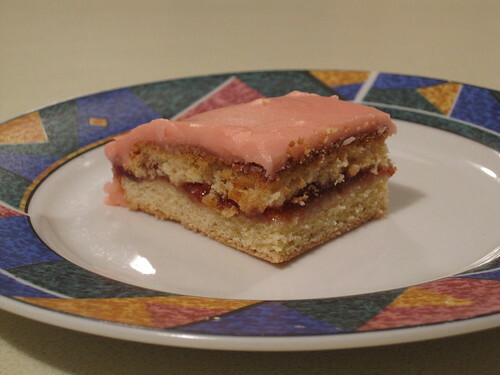 It may be a New Zealand thing but I would have thought using Raspberry Jam in a Rasberry Slice would have been an automatic thing. That’s true about raspberry jam, but if I substituted apricot jam I’d call it an apricot slice.